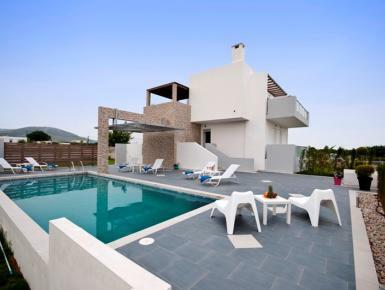 XENOS VILLA is a luxury villa near the organized beach of Tigaki (500- 600 meters away). It is an ideal family or group holiday rental. Build on 2.000m2 of land in an area made of exclusive private villas. Located 9 Km from the Airport , 1 Km from Zipari village and 500 meters from a large number of fine restaurants, bars and shops at the very popular destination village of Tigaki . The interior of the villa is of modern design with large windows and a stunning view to the sea. You can also see the island of Kalymnos and Turkey’s coast from the living room. The villa provides all the facilities a large group may need and a layout that stretches over 3 floors and 180 m2, allowing plenty of personal space for its residents.